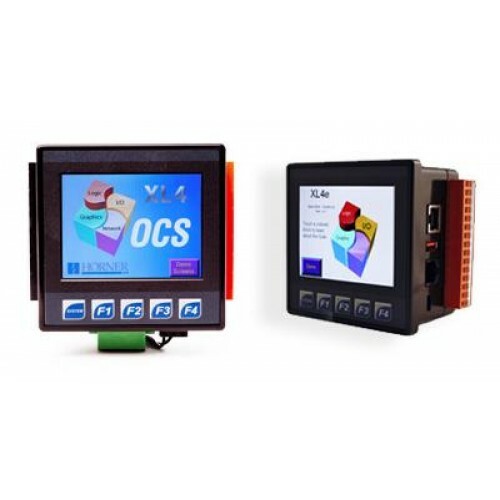 The XL4 All-in-One controller with a built-in 32,000 colour TFT touch screen, I/O-Modules, networking options, removable MicroSDCard and USB ports. Programmable by Horner APG's industry recognised Cscape software, XL4 can control a wide range of different processes and machines from small to medium applications. The XL4 is in the same ¼ DIN form factor as our extremely popular XLe & XLt. 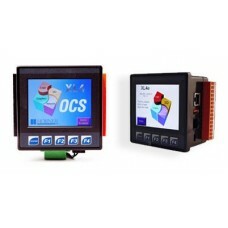 The XL4 LCD TFT Display is in full colour with QVGA resolution. Screens previously developed for the XLe & XLt can be upscaled automatically and then enhanced. In addition - XL4 screen updates are extremely fast. The XL4 model now has 100Mbps Ethernet built into every model. No special add-ons or accessories are needed. The XL4 Ethernet support includes an integrated Web Server, FTP Host, Email, Modbus/TCP Master/Slave, Programming, and much more. You can create your own mobile friendly web-apps, access logged data, and setup the device to work on your network. Now's that's what we call an All-In-One Controller! The XL4 includes both a USB Host port and a USB On-the-go Port - each at USB 2.0 speeds (480Mbps). The Host Port allows connection of removable FLASH drives, supporting drives up to 2TB. The On-the-go Port provides the fastest communications interface for Programme Change on Line (Online Change). The XL4 supports true Online Programming - allowing the logic program to be modified on-the-fly without entering stop mode. That's invaluable for machine and process modifications. The XL4 features Advanced High Speed Counting & Analog Specifications. The 2 channel High Speed Counter accepts frequencies exceeding 500kHz, supporting a variety of modes including Totalizing, Quadrature, Pulse Measurement, Frequency Counting and Setpoint Controlled Outputs. The 0-10V / 4-20mA Analogue Input resolution has been increased from 10-bit to 12-bit for most models, with 14/16-bit resolution for the Model 5 and 14/17bit for the Model 6.